Queen Victoria’s husband, Prince Albert, the Prince Consort died on 14 December 1861. The three daily services on the 150th anniversary of his death will be held in the Albert Memorial Chapel. During the morning a documentary about Prince Albert will be broadcast on BBC Radio 4 which was partly recorded in St George’s Chapel. Peter Snow talked to Tim Byram-Wigfield, Director of Music, about the funeral service and in particular the music played on that occasion. 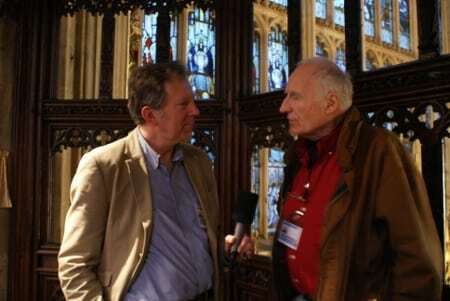 The photograph shows Peter Snow and the programme’s producer (Andrew Green) in the Edward IV chantry recording part of the programme. They are standing at the oriel window from where the widowed Queen Victoria watched services (though not Prince Albert’s funeral as she remained grief stricken in Osborne House). The east window in the background is a memorial to Prince Albert.